It’s been a while since my last review. I was out of town last week and sick for part of the weekend, thus my absence. For those not following the Twitter account @VC_Reviews, I wrote a guest post (“The 10 Best Movies You Didn’t See in 2011”) for a friend’s blog about a week ago. That link is http://tellurianthings.wordpress.com/2012/01/02/new-post-2/ and if you’re into TV recaps, comics or films, it’s a blog for you. 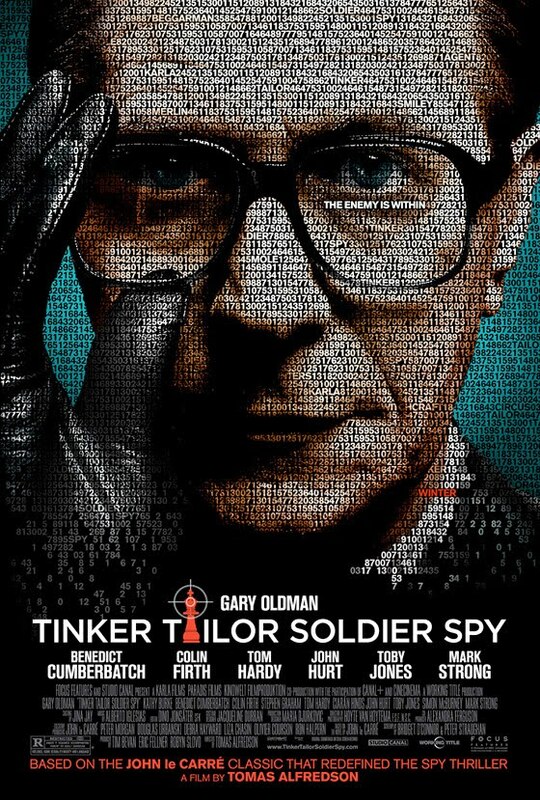 Anyway, back to “Tinker Tailor Soldier Spy” (bit of a tongue twister, right?). This spy thriller, orginally penned by British author John le Carre in 1974, features a fantastic cast (found above on the poster) with old school class like John Hurt and Colin Firth as well as up-and-coming stars Tom Hardy and Benedict Cumberbatch. The story follows retired spy George Smiley (Gary Oldman) who is called back in to investigate a possible mole inside British intelligence. With the help of an aide still on the inside (Benedict Cumberbatch), Smiley must narrow down four agents (Toby Jones, Colin Firth, Ciaran Hinds and David Dencik) to one spy. Swedish director Tomas Alfredson, behind one of the best recent Swedish films, “Let the Right One In,” takes the helm and delivers a meticulously-paced gem. This is a very British film: not a lot of color, relatively low budget and really bad teeth. While it is marketed as a thriller (judging from the trailer), this is nothing like what spy films have become today. There are no Jason Bourne fighting techniques or James Bond gadgets. It’s more of a low-key mystery. Sound boring? It might be if not for a great cast and a good story. There really isn’t a bad performance in the film. If I had to declare a winner, I’d probably say the best performances are by Tom Hardy, Gary Oldman, John Hurt and Mark Strong. That’s how well each actor does. I was forced to pick four perfromances for the gold medal. There has also been talk of Benedict Cumberbatch (who recently got a big break being cast in the new “Star Trek” film) and Colin Firth. Although it’s great for the film to have so many good performers, the range of actors has really hurt the film’s chances at award ceremonies. How do you choose one (or at most, two) great performances to nominate? The actors end up ruling each other out for contention. I believe this is what also happened to “The Ides of March” although the latter is getting a little more attention. The best and worst thing about “Tinker Tailor Soldier Spy” is that it doesn’t treat its audience like 5-year-olds. After seeing more recent spy films, the pace does feel a bit slow, even if it isn’t THAT slow. The film jumps around in timeline and doesn’t feel the need to explain who so-and-so is or why Smiley feels the need to buy new glasses. It just shows stuff happening. How refreshing. Aside from this, I think my only real complaint is that I never really felt a level of tension with the film. There didn’t seem to be a race against the clock or a moment where the bad guys looked like they would prevail or anything like that. Smiley and his assistant conduct a thorough investigation and the film ends. That’s all. Not having read the source material, I can’t comment on whether the book does a better job of this. While I loved the performances and thought it was a very intelligent film, it lacked that special something to make it the great film it could have been. For those interested, I plan to write a Golden Globes preview in the coming week and will be live-tweeting the award show at @VC_Reviews. Good afternoon and happy viewing.